The history of Buddhism in Japan can be roughly divided into three periods, namely the Nara period (up to 784), the Heian period (794-1185) and the post-Kamakura period (1185 onwards). Each period saw the introduction of new doctrines and upheavals in existing schools. In modern times, there are four main paths of Buddhism, to which all schools of Japanese Buddhism belong: the Amidist (Pure Land) schools, Nichiren Buddhism, and Zen Buddhism. Fusang is located to the east of China, 20,000 li (1,500 kilometers) east of the state of Da Han (itself east of the state of Wa in modern Kyushu, Japan). In former times, the people of Fusang knew nothing of the Buddhist religion, but in the second year of Da Ming of the Song dynasty (467 CE), five monks from Kipin (Kabul region of Gandhara) travelled by ship to Fusang. They propagated Buddhist doctrine, circulated scriptures and drawings, and advised the people to relinquish worldly attachments. As a results the customs of Fusang changed (In the original Ch: «扶桑在大漢國東二萬餘里,地在中國之東(..)其俗舊無佛法,宋大明二年,罽賓國嘗有比丘五人游行至其國,流通佛法,經像,教令出家,風 俗遂改», Liang Shu, 7th century CE). The introduction of Buddhism to Japan is securely dated to 552, when Baekje monks from the Korean peninsula came to Nara to introduce the eight doctrinal schools. Initial uptake of the new faith was slow, and Buddhism only started to spread some years later when Empress Suiko openly encouraged the acceptance of Buddhism among all Japanese people. In 607, in order to obtain copies of Sutras, an imperial envoy was dispatched to Sui dynasty China. As time progressed and the number of Buddhist clergy increased, the offices of Sojo (archbishop) and Sozu (bishop) were created. By 627 there were 46 Buddhist temples, 816 Buddhist priests, and 569 Buddhist nuns in Japan. 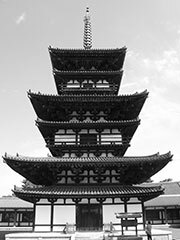 There were traditionally six schools of Buddhism in Nara Japan: Ritsu (Vinaya), Jojitsu (Satyasiddhi), Kusha (Abhidharma) Sanron (Madhyamika), Hosso (Yogacara), and Kegon (Hua-yen). However they were not exclusive schools, and temples were apt to have scholars versed in several of the schools. It has been suggested that they can best be thought of as ‘study groups’. The Satyasiddhi school is considered to be an offshoot of the Sautrantika school, one of the Nikaya schools of Indian Buddhism (see early Buddhist schools). They were distinguished by a rejection of the Abhidharma as not being the ‘word of the Buddha’. The name means literally, «Ends with the Sutras,» which refers to the traditional order of texts in the Tripitaka — vinaya, sutra, abhidharma. Introduced into Japan from China during the Nara period (710–784). The school takes its name from its authoritative text, the Abidatsuma-kusha-ron(Sanskrit:Abhidharma-kosa), by the 4th- or 5th-century Indian philosopher Vasubandhu. The Kusha school is considered to be an offshoot of the Indian Sarvastivada school. Literally: Three-Discourse School; a Madhyamika school which developed in China based on two discourses by Nagarjuna and one by Aryadeva; this school was transmitted to Japan in the 7th century. (Madhyamika is one of the two most important Mahayana philosophies, and reemphasizes the original Buddhist teachings that phenomena are neither truly existent or absolutely non-existent, but are characterized by impermanence and insubstantially. The Yogacara (瑜伽行派 Yugagyouha) schools are based on early Indian Buddhist thought by masters such as Vasubandhu, and are also known as «consciousness only» since they teach a form of idealism which posits that all phenomena are phenomena of the mind. The Hosso school was founded by Xuanzang (玄奘, Jp. Genjo), China, c. 630 AD, and introduced to Japan in 654 AD. The Discourse on the Theory of Consciousness-Only (Jo yuishikiron 成唯識論) is an important text for the Hosso school. Also known by its Chinese name Huayen (華厳), the Kegon school was founded by Dushun (杜順, Jp. Dojun), China, c. 600 AD, and introduced to Japan by Bodhisena in 736 AD.The Avatamsaka Sutra (Kegonkyo 華厳経) is the central text for the Kegon school. The Late Nara period saw the introduction of Esoteric Buddhism (密教, Jp. mikkyo) to Japan from China, by Kukai and Saicho, who founded the Shingon and Tendai schools. The later Heian period saw the formation of the first truly Japanese school of Buddhism, that of Nichiren. Known as Tiantai (天台) in China, the Tendai school was founded by Zhiyi (智顗, Jp Chigi) in China, c. 550 AD. In 804 Saicho (最澄) traveled to China to study at the Tiantai teachings, at Mount Tiantai. However before his return he also studied, and was initiated into the practice of the Vajrayana — with emphasis on the Mahavairocana Sutra. The primary text of Tiantai is Lotus Sutra (Hokkekyo 法華経), but when Saicho established his school in Japan he incorporated the study and practice of Vajrayana as well. Kukai traveled to China in 804 as part of the same expedition as Saicho. In the T’ang capital he studied esoteric Buddhism, Sanskrit and received initiation from Huikuo. On returning to Japan Kukai eventually managed to establish Shingon (真言) as a school in its own right.Kukai received two lineages of teaching — one based on the Mahavairochana Sutra (Dainichikyo 大日経), and the other based on theVajrashekhara. The Kamakura period saw the introduction of the two schools that had perhaps the greatest impact on the country: the Amidist Pure Land schools, promulgated by evagelists such as Genshin and articulated by monks such as Hōnen, which emphasize salvation through faith in Amitabha and remain the largest Buddhist sect in Japan (and throughout Asia); and the more philosophical Zen schools, which were equally rapidly adopted by the upper classes and had a profound impact on Japanese culture. Several variants of Zen (禅宗) were separately brought to Japan. Note that Zen influences are identifiable earlier in Japanese Buddhism, esp. cross-fertilization with Hosso and Kegon, but the independent schools were formed quite late. The schools of Nichiren Buddhism trace themselves to the monk Nichiren (日蓮: «Sun-Lotus») and the proclamation of his teachings in AD 1253. Doctrinally the schools focus on the Lotus Sutra (妙法蓮華経: Myoho Renge Kyō; abbrev. 法華経: Hokkekyō), but practice centers on the mantra Nam(u) Myōhō Renge Kyō (南無妙法蓮華経). Nichiren Buddhism split into several denominations after the death of Nichiren, typically represented by tradition-oriented schools such as Nichiren Shu and Nichiren Shoshu and «new religions» such as Soka Gakkai, Rissho Kosei Kai, and Reiyukai. See Nichiren Buddhism for a more complete list. 654: Dosho introduces the Hosso (Faxiang) school to Japan. 736: Bodhisena introduces the Kegon (Huayan) school to Japan. 753: Ganjin introduces the Ritsu (Lü, Vinaya) school to Japan. 807: Saicho introduces the Tendai (Tientai) school to Japan. 816: Kukai founds the Shingon school. 1175: Honen introduces the Jodo (Pure Land) school to Japan. 1191: Eisai introduces the Rinzai (Linji) school to Japan. 1227: Dogen introduces the Soto (Caodung) school to Japan. 1253: Nichiren founds the Nichiren school. 1282: Nichiren school begins to split into several schools. 1654: Ingen introduces the Obaku (Huangbo) school to Japan. Asakawa, K and Lodge, Henry Cabot (Ed.). Japan From the Japanese Government History.